There will be more than a few times that you will need a professional Kyle plumber to call on. It doesn't matter if you need a residential or commercial plumber, either way the work has to be spot on. Since 1986, Moore & More Plumbing has been the answer to that predicament for countless locals. These are not just previous clients, they are satisfied customers. The level of quality workmanship we provide for each of our clients is how we have earned the flawless reputation that we have. Not to mention, it is also how we have earned the high rate of repeat and referral business we have. No matter what it is that you may need done, give us a call today to get started. We look forward to working with you and providing you with the high quality results you deserve as your preferred Kyle plumbing company. Don't settle for anything less than the best when it comes to your plumbing work. Since 1986, we have been the trusted go-to team for a variety of essential plumbing service needs. The point of being the best in the business is also being able to supply our customers with the services that they need. If you still have to call someone else to take care of work other than plumbing repairs in Kyle, TX, what is the point? Leaking Pipes – We will find the cause and rectify the situation in a prompt and professional manner with proper leak repairs. Sump Pumps – Make sure that your basement or crawlspace doesn't get flooded by having this system in place. Water Treatment & Testing – Make sure that the water you and your loved ones are exposed to is clean and safe. Water Heaters – Make sure that the water heater you have is in proper working order by letting us provide you with the quality service you need. Tree Root Infiltration – When tree roots grow and damage your plumbing, we can help fix the problem for you. 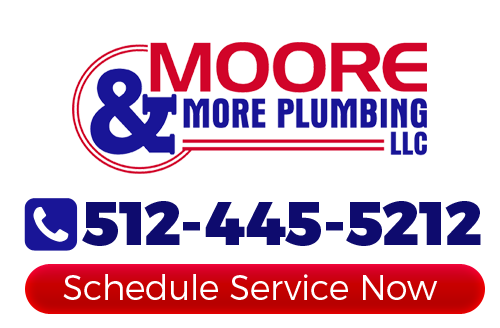 Moore & More Plumbing is the only name that you need to know in order to get the quality plumbing services in Kyle, TX that you need. We will arrive with a fully stocked truck, all of our professional plumbers will be in an easy to identify uniform. The bottom line is that we care about each client we work with and want to deliver the best in results. The only way to make that happen is to provide you with expert workmanship, customer care and all at affordable pricing. If you are looking for a professional Kyle plumber then please call 512-445-5212 or complete our online request form.